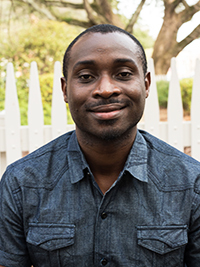 Cajetan Iheka’s research and teaching focus on African and Caribbean literatures and film, postcolonial studies, ecocriticism, ecomedia, and world literature. He is the author of Naturalizing Africa: Ecological Violence, Agency, and Postcolonial Resistance in African Literature (CUP 2018), and co-editor of African Migration Narratives (Rochester UP 2018). He is currently working on two projects, namely a monograph that examines ecomedia in Africa, more specifically, the articulations of the continent’s ecological issues in photography, film, and other artistic media. His other project is the MLA volume, Teaching Postcolonial Environmental Literature and Media. Cajetan also serves as associate editor for African Studies Review, the journal of the African Studies Association. He directs the UA in South Africa “Resistance and Freedom” study abroad program. Professor Iheka is the recipient of a number of awards and fellowships, including the Carnegie Africa Diaspora Fellowship and an Andrew Mellon Fellowship from the Harry Ransom Center, University of Texas at Austin. Naturalizing Africa: Ecological Violence, Agency, and Postcolonial Resistance in African Literature. Cambridge University Press, 2018. Contemporary African Migration Narratives: Politics, Race, and Space. University of Rochester Press, 2018 (co-edited with Jack Taylor). “Dispossession, Postcolonial Ecocriticism, and Doris Lessing’s The Grass is Singing.” ISLE: Interdisciplinary Studies in Literature and Environment. Forthcoming. “The Nigerian Novel and the Anti-Colonial Imagination.” Oxford Handbook of Nigerian Politics. Oxford: Oxford University Press, 2018. Forthcoming. “Visual Representations of Women in African Cinema.” Changing Perspectives on African Women and Gender. Eds. Nwando Achebe and Claire Robertson. Madison: University of Wisconsin Press, 2018. Forthcoming. “Rethinking Postcolonial Resistance in Niger-Delta Literature: An Ecocritical Reading of Okpewho’s Tidesand Ojaide’s The Activist.” The Postcolonial World. Eds. Jyotsna Singh and David Kim. London and New York: Routledge, 2016. 425-38. “Conflicts in Africa and the Use of Child Soldiers: A Human Rights Analysis.” Human Rights: A Cross-Cultural Perspective. Eds. Michael U. Mbanaso and Chima J. Korieh. Glassboro: Goldine & Jacobs Publishing, 2014. 95-113. “Nollywood and the Nigerian Dream: The Example of Teco Benson’s Formidable Force.” The Global South7.1 (2013): 122-136.